In sharpening tools, time and care will do a better job than brute strength and awkwardness. Hold the tool on the stone so that the heel of the tool touches the face of the stone in its entirety (Image 14, Figures 3-1, 3-2). This is important. Nothing is harder to use than a tool on which the heel has been rounded through careless sharpening. I have found that on straight-edged toolschisels, straight and skew, and parting tools-the best way to bring up an edge is to pass the tool along the oilstone by pushing it forward. Don't try to rotate the tool on the face of the stone until you have become expert at the job. You may round over the corners and that spoils the tool for its designed cut. 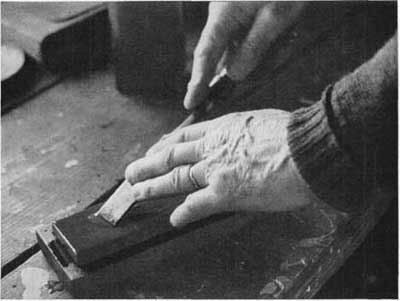 Position of tool on sharpening stone: in this case, a firmer chisel showing how I hold the tool and flood the stone face with oil. 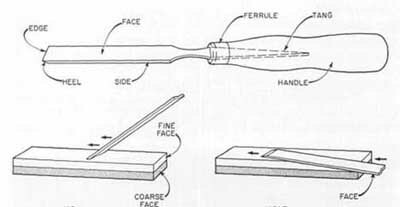 After the tool has been edged, reverse it and pass the face of the tool-that is, the flat side of a chisel, the reverse side of a skew-across the stone to remove the burr or wire edge. Then hone the tool on the wet stone the same way. Don't try to hurry the process. There are no short cuts. The finished edge, after honing, should be stropped on leather. 1. To sharpen a chisel (or any straight-edged tool), keep heel on stone at angle about 27°. Move tool under light pressure in direction of arrows. Keep edge at approximately right angles to sides of stone. Stropping consists of passing the tool across a leather face. I use a piece of sole leather about 10 inches long, 4 inches wide, with one edge chamfered. Mount this on a 2-inch block, with brads driven into the four corners and set below the face of the strop. Load the strop with lapping compound (Carborundum flour, No. 400 grit) . Keep the strop moist with oil and, in stropping, put the heel of the tool on the strop and pull toward you. If it is a gouge, rotate the tool from side to side as you pull. Don't push, or you will cut the leather. Use the same procedure on all faces of the cutting edges that can be brought to bear on the leather. Half a dozen strokes ought to be enough if the sharpening and honing have been done properly. of gouge. Do not use too much pressure. By the time you have sharpened your tools you have learned that it isn't the easiest part of the business. Therefore, keep in mind the fact that you don't want to repeat the process. The answer: don't put your tools down on the bench where the fine edge that you've developed can touch any other tool or metal. Don't try to overdrive the tool into hard stock; you'll fracture its edge. I have made a bench tray that I find most useful and I have developed the knack of putting my edged tools back in the tray after I have used them. Keep the tools in your chest when you don't want to use them. Take out only those tools you think you want for that particular day's work. Don't have too many tools lying about on the top of your bench. If you hit the edge of a tool against another, take time out to resharpen it on the theory that it's nicked. You'll learn; it probably is. Tools in the bench tray. Never let other people handle your carving tools any more than you would lend them your toothbrush and don't use carving tools for carpentry work. 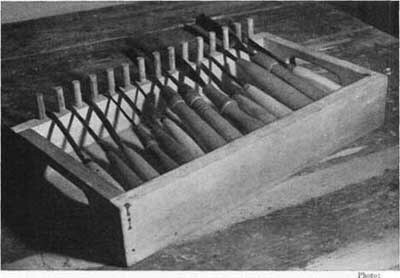 Buy carpenters' tools. And vice versa.